More information about Commcare module you will find in the Commcare module topic. To add configuration you must use Add configuration button . After filling in the data, press the Save button. To verify the provided data, click the Verify button. The Commcare module will send a test request to the CommCareHQ, attempting to authenticate with the credentials you have provided. If everything works OK, you will be notified about successful connection. If there were any problems connecting to the CommCareHQ, an error will be displayed and you will not be able to work with the Commcare module, until valid credentials are provided. You can provide more than one account configuration. Only one of the supplied configuration can be the default. The default configuration will be selected whenever you do not specify a particular configuration. To mark the configuration as default you must save the configuration(if it is new) and use Make default button. Once you switch the option, the events fired by the Commcare module will contain only the fields you have chosen to forward. To let CommCareHQ know, where the data should be forwarded, you also need to set up data forwarding URLs. This can be achieved in two ways. The first way is to do it via the checkboxes. If you want to set up CommCareHQ to forward the data to the Commcare module, select the checkbox and the Commcare module will automatically set up an URL on your CommCareHQ account. To use those checkboxes you must set the server URL in the Settings tab in the Admin module. If for any reason, the first way doesn’t work or sets up invalid URL, the data forwarding rules can also be set in the project settings on your CommCareHQ account. If you have enabled the rules via the slider buttons, you can also verify that the correct rules (with proper URL to your server) have been set up on the CommCareHQ. To disable the data forwarding rules, you have to open the project settings on your CommCareHQ account and disable them from there. The Commcare module can only set up the rules, but cannot disable them. As you can see the provided URL http://demo.motechproject.org/module/commcare/forms/ doesn’t have specified configuration. So if the Commcare module receives data, the default configuration will be used. 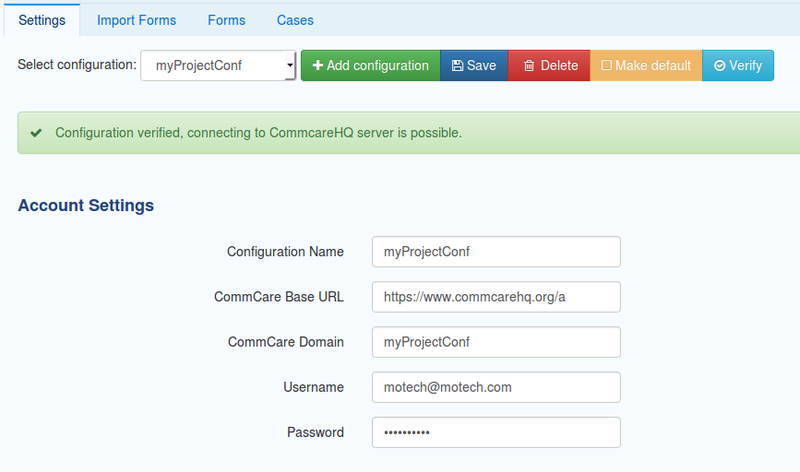 To work with more than one configuration you will have to use for example such URL http://demo.motecproject.org/module/commcare/forms/myProjectConf. The URL with the configuration name should be automatically added by the Commcare module. org.motechproject.commcare.api.schemachange. Fired, when the project schema gets changed on the CommCareHQ (module added, form edited, etc.). org.motechproject.commcare.api.forms Fired, when a new form has been received on CommCareHQ or when form has been imported. One event per received/imported form. org.motechproject.commcare.api.case Fired, when a new form has been received on CommCareHQ. One event will be fired per affected case. org.motechproject.commcare.api.formstub Fired, when a new form has been received on CommCareHQ. Contains only IDs of affected form and cases. org.motechproject.commcare.api.receivedStockTransaction Fired, when a stock transaction object was fetched by querying the CommCareHQ stock ledger. The Commcare module will automatically update the Tasks triggers and data sources, each time a schema change event is received. For each form and for each case type, a separate trigger and data source object will be created. This means that you can trigger tasks, when a certain form or case is received and use its fields in an action you select. The fields of forms and cases are based on the schema received from CommCareHQ. The Commcare module also provides an action for querying the CommCareHQ stock ledger for the stock transactions and a trigger for retrieving the stock transactions.